I was sorry to leave Leon, in the end. I had experienced many more mind-blowing incidents than could be covered in a reasonably lengthed blog post. I had met people from my past and my present and seen unique sights, some large and touristy, some small and personal. 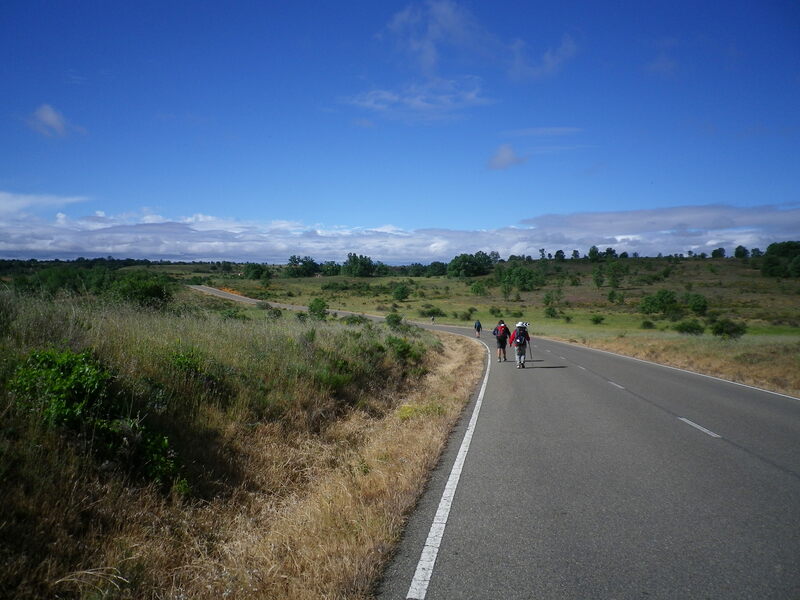 I had renewed my joy of being on the Camino and excitement began to build – the next major city I would hit would be Astorga and then, Santiago. Santiago! Had I really gotten that far following my rain-soaked guidebook? The sky was gray as I started out in the early morning (up earlier than usual, that’s the sense of excitement kicking in). I left the money for the room on the dresser since there was no front desk. I hoped for the best in honesty and charity, that the money would get into the right hands. The walk out of town was slightly uphill and went through a few more interesting sights. 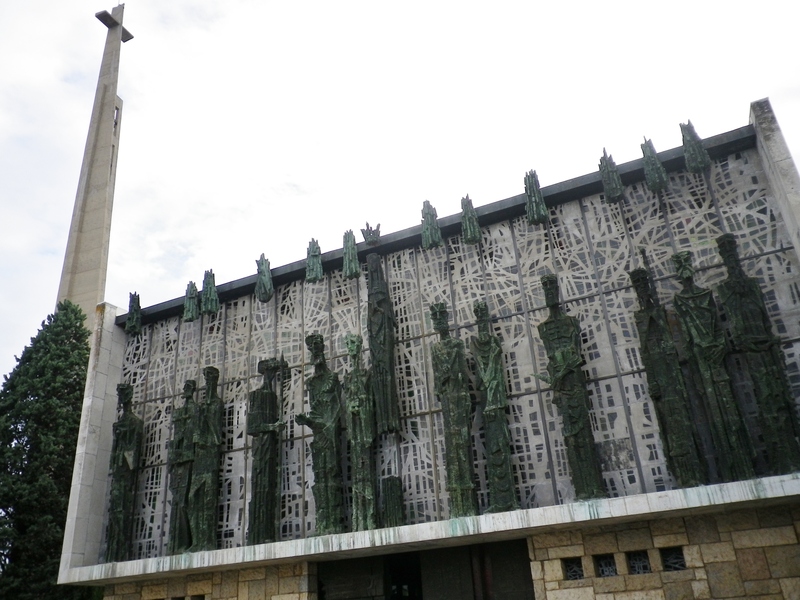 One of the most modern churches on the Camino was on the outskirts of Leon, Iglesia San Froilan, La Virgen del Camino. Do I like the contemporary architecture better than the old Gothic? Maybe, but maybe I’m just tired of Gothic. Contemporary was a refreshing change of architectural pace. La Virgen rises above the Apostles. Shortly after the Church, there is a choice to be made – take the recommended or the optional path? For a change, I decided to go the recommended route. It seemed to go through more countryside and I was feeling strong and confident. For the most part, the route was on a plateau with few places to stop for refreshments along the way. Also, few pilgrims. The wind was strong and a little chilly but the sun had come out and the only real challenge was mental, not physical. My rain jacket, which doubled as my windbreaker, came on and off several times. I met a woman named Gabby and we walked the rest of the day together. She was about my age, a little younger, and was also walking the Camino for the first time. She was walking solo. We chatted for several kilometers, comparing notes and experiences, asking why each was walking. She told me of a dream she had had the night before. She dreamt that, for the first time, her ex-husband’s wife wanted to talk to her. Why ? She had no idea. She and her husband were happily married for 30 years and had several children. When she turned 50, she decided to do something different. She decided that she wanted to give a recital. She was a very amateur musician (practicing music had long since taken a back seat to raising a family) yet this was something she had always yearned to do – play her cello for friends. She shared this idea with her family, who were all supportive. She practiced diligently for the next year in preparation for her performance. She hired a hall and sent invitations. She got an accompanist and, with her teacher, selected a series of perfect pieces. She learned them well. She gave her recital on her birthday to a hall crowded with friends and family. It was a success! The applause and congratulations, the respect and admiration of the audience of well-wishers were more than she anticipated. She felt honored and successful. She felt empowered – who wouldn’t? She was a novice who pulled off giving a successful recital. All the planning and hard work had paid off. Her children were especially proud of her. Describing the event to me, as we walked along the Camino, brought an energy and happiness into her voice that was infectious. I realized I was smiling and my heart felt full of joy for her success. I couldn’t help but be delighted for her “chutzpah” at pulling off the event and pulling it off well. A week after her recital, her husband told her he wanted a divorce. I was dumb-founded and stopped in my tracks. We were walking an area known as the paramo. wide open with the horizon going off as far as you could see. 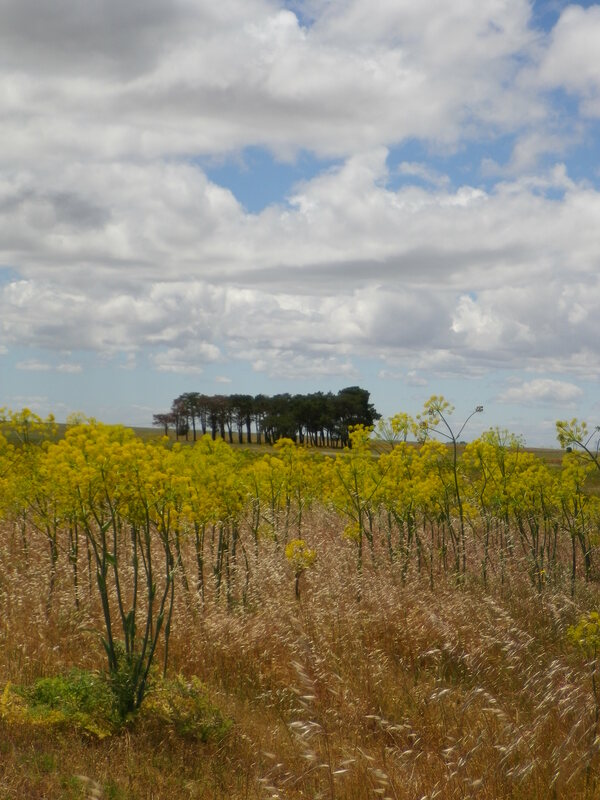 The Camino was silent except for birds in the distance and the breeze in the nearby pasture blowing through flowers. 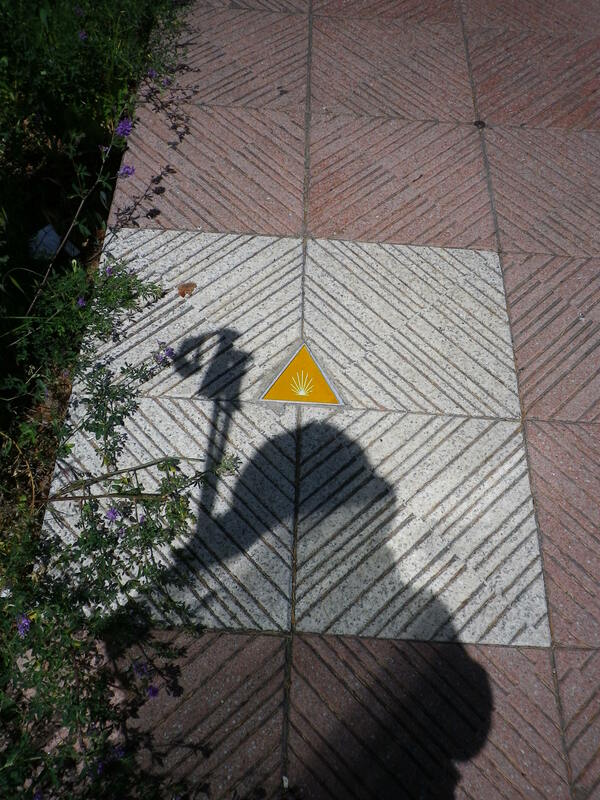 She walked on a few steps, then stopped and turned back towards me, silently urging me to continue our Camino. I took a moment to process this strange turn of events in her story. Then we began walking again. She says she had had no clue and was totally taken by surprise. He had begun an on-line relationship with an old flame from his high school days. Their correspondence had rekindled that old flame. He decided that he needed to take that relationship to the next level. Gabby, of course, would have no place in that scenario. She was stunned, hurt, and felt very betrayed. Her children were as taken by surprise as their mother. He was insistent. Long story short, she was now a divorced woman after 30 years of marriage to a man she loved and a family she doted on. She didn’t, of course, have much to do with the new wife (yes, he married soon after) but she was shy and introverted, not belligerent and one to rant. Her children stood by her all the way and she was grateful for that. Now, she was walking the Camino. When I asked her if the divorce was the reason why she was walking, she thought about it a moment and said that she honestly didn’t think so. Five years had given her time to get her bearings and she was doing well. She had settled into her new life and was happy. And, last night, she dreamed that the new wife wanted to talk to her. 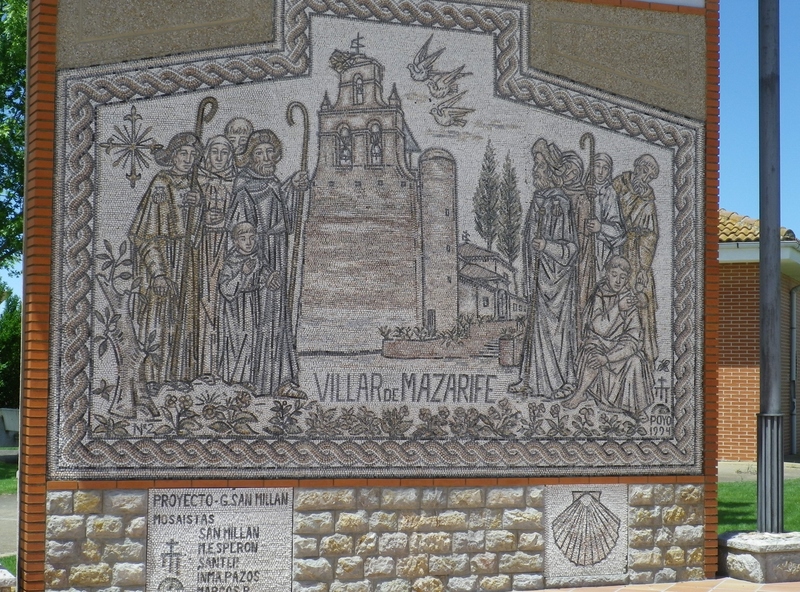 This entry was posted in camino de santiago de campostella, Spain, Travel and tagged Camino de Santiago de Campostella, Catholic Church, family, pilgrimage, Spain, Travel, women hikers, women hiking solo. Bookmark the permalink. Life takes strange twists. It could be that when she showed her strength and grit in doing the recital so successfully, her husband was enabled to believe she could also handle his asking for a divorce. Or equally, that her development of strength and purpose did in fact enable her to survive this blow. Looking at my own life, sometimes it is hard to determine which is cause and which is effect. HI, Allyson. Yes, your insight is so true – which is the cause and which is the effect? I suspect Gabby is still trying to figure it out.